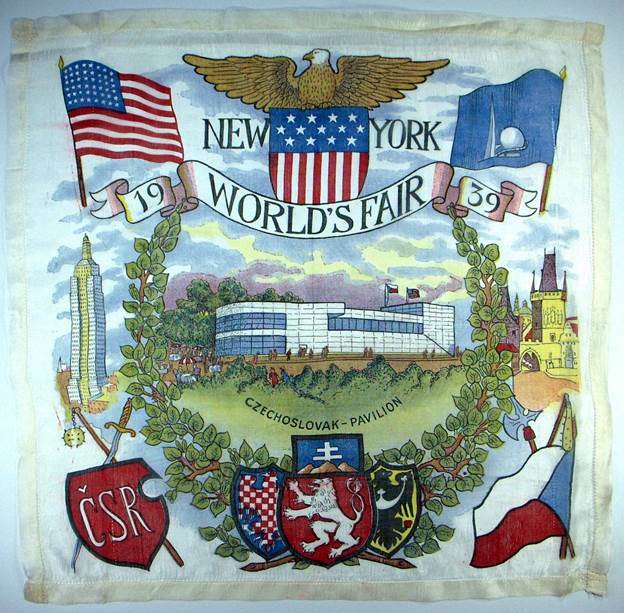 Covering 1,216 acres in Flushing Meadows, the fair stretched for 3.5 miles. 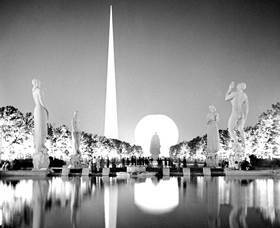 On opening day, 206,000 visitors attended, many witnessing President Franklin Roosevelt’s opening speech. Thousands more watched the speech on 200 televisions placed in various locations throughout the fair. Because many thought television was somehow a trick – manufacturers decided to create one tv with a transparent case, so people could see the internal components. 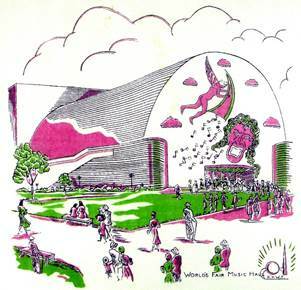 General Electric, Westinghouse and the RCA pavilions all displayed televisions. In addition Westinghouse created a Time Capsule that was not be opened for 5,000 years (the year 6939). Can you guess what it contained? (Answer at the end). What do you think a time capsule of today should contain? 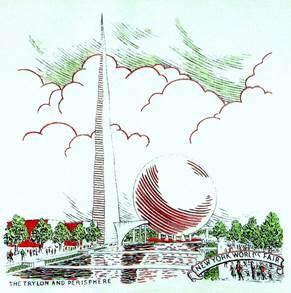 The Trylon, a three sided pylon, rose nearly 700 feet in the air, and the companion Perisphere measured 185 feet in diameter. 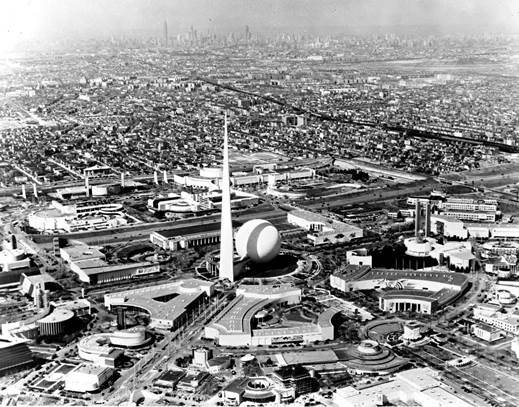 Made of reinforced steel and concrete, the two structures weighed nearly 10,000 tons, and could be seen from almost anywhere at the fair. Pictured here is a workman standing on the Perisphere. 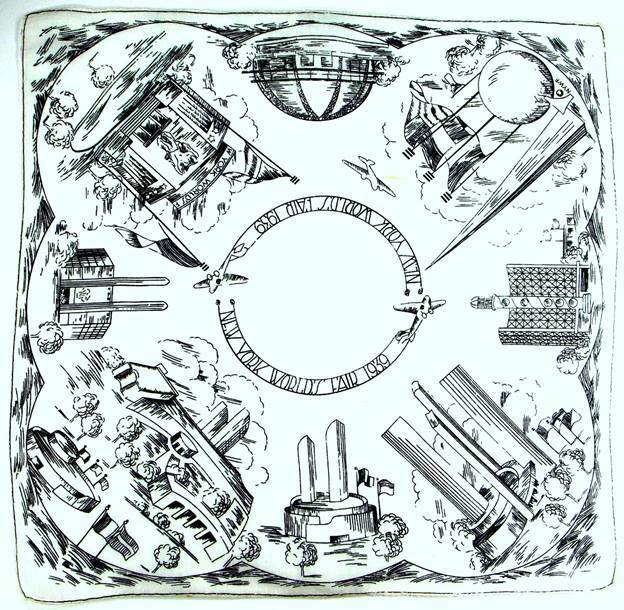 The Trylon and Perisphere were featured on every type of souvenir, including the ubiquitous handkerchief. 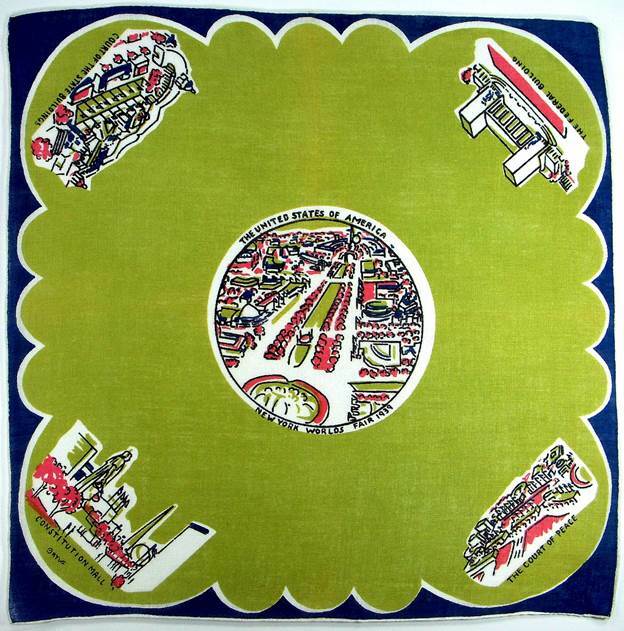 Detailed handkerchief maps could save a fairgoer from becoming lost. 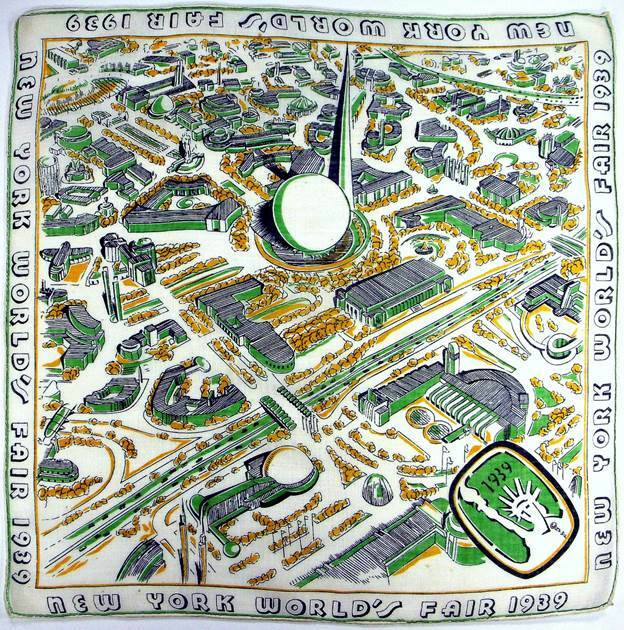 More durable than a paper map, they made a great fashion accessory as well. The attention to detail made navigation easy. 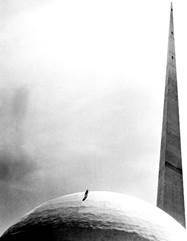 The giant landmarks could be found in every permutation from sleek and modern, to humble and homemade. 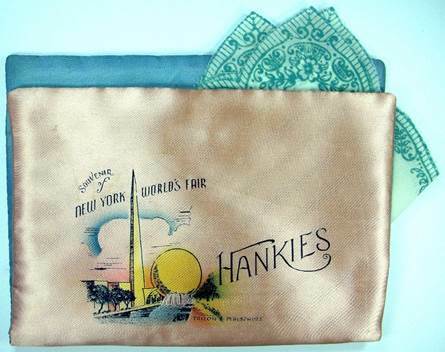 A silk souvenir handkerchief envelope for storing hankies. 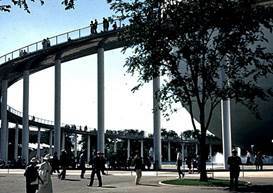 A circular skyway which led into the Perisphere not only created a sense of anticipation for fairgoers, it helped to alleviate crowds at ground level. 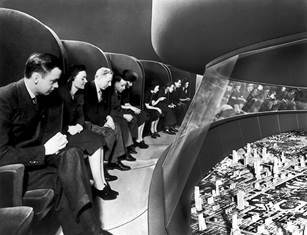 Inside the Perisphere was a diorama called “Democracity”, a model of the utopian city of the future, planned to house 1,000,000+ people. 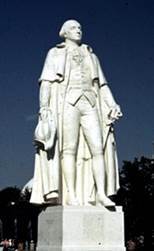 Particularly spectacular when illuminated at night, you can see the silhouette of Washington against the backdrop of the glowing Perisphere. Elegant statues of the Four Freedoms (Speech, Press, Religion, Assembly) by Leo Friedlander grace Constitution Mall and the reflecting pool. 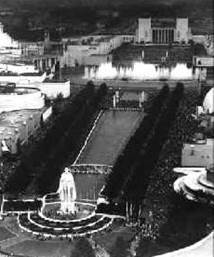 Note the tiny people seated at the base of the statues and strolling on the mall. Here’s a bird’s eye view of the monumental George Washington statue set against the backdrop of the reflecting pool and double colonnade of trees. The same image is featured below in the center of this chartreuse, geranium and navy beauty. 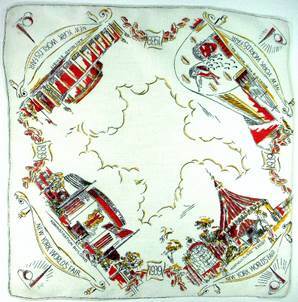 Most handkerchiefs featured multiple pavilions. 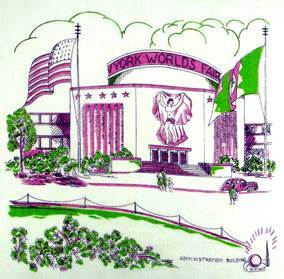 Note the hankie on the right includes the Florida Pavillion in the northeast corner. 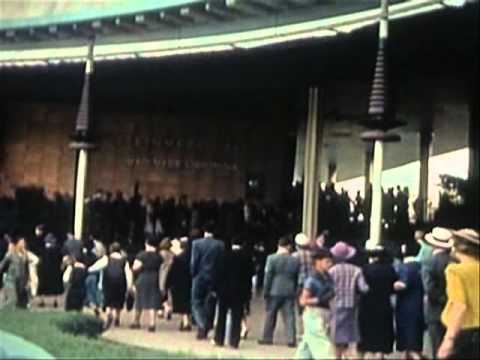 Each of the 48 states had their own pavilion. 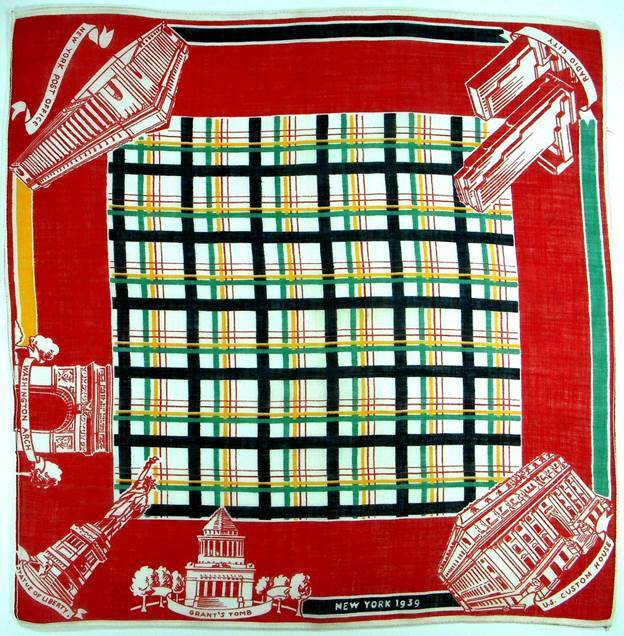 Note the Administration Building and Music Hall are featured in the hankie on the upper left. 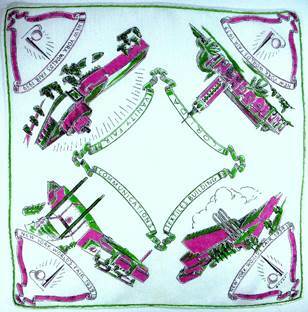 Below, each pavilion is also showcased solo on a handkerchief. 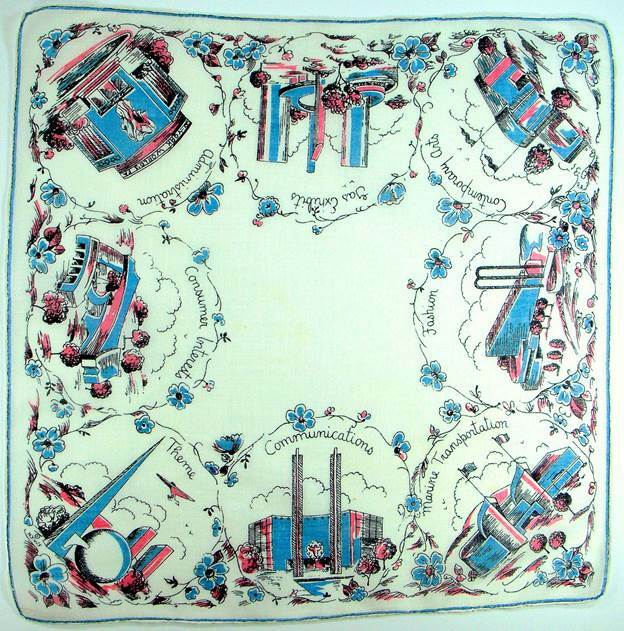 Many hankies focused on a single pavilion or exhibit, a treat for collectors who favored a singular subject. 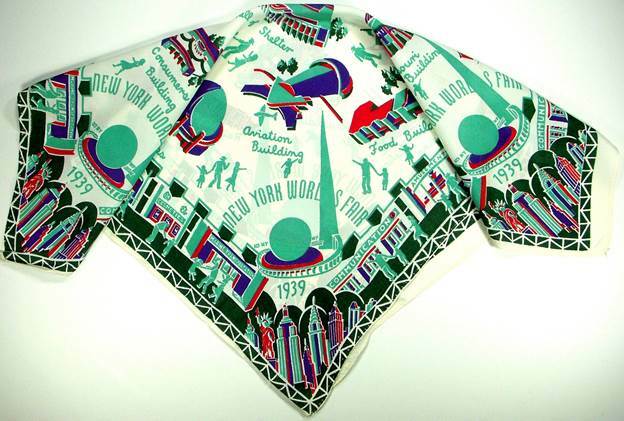 While this rayon number features every pavilion imaginable in a riot of activity and color. 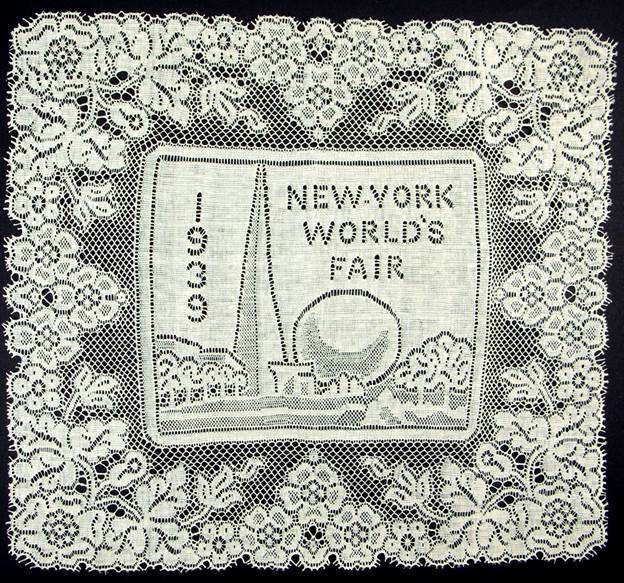 Speaking of rayon and other man-made fabrics, here’s a souvenir crafted from “genuine machine-made” lace, as evidenced by the unfinished cut edges, flat appearance, and uniformity of stitches. Today we prize handmade lace, recognizing not only the skill, but investment of time taken to complete a piece. 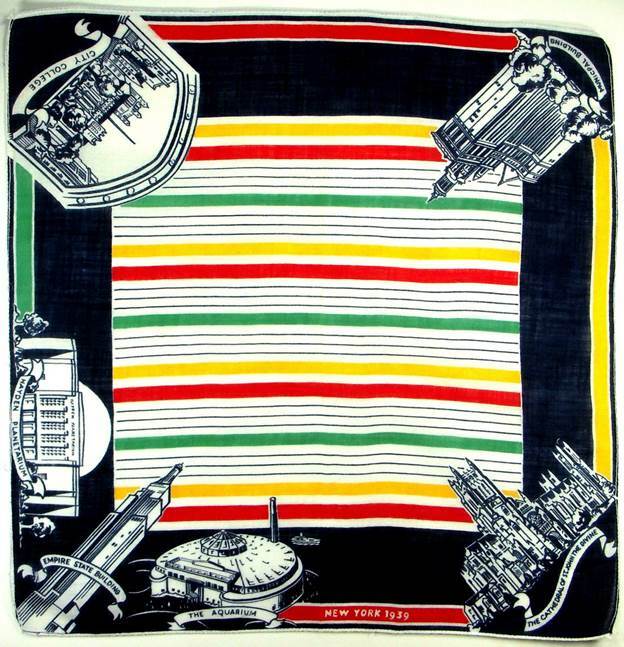 But the fair was meant to showcase “modern” technology, and prized this creation for the time saver that it was. 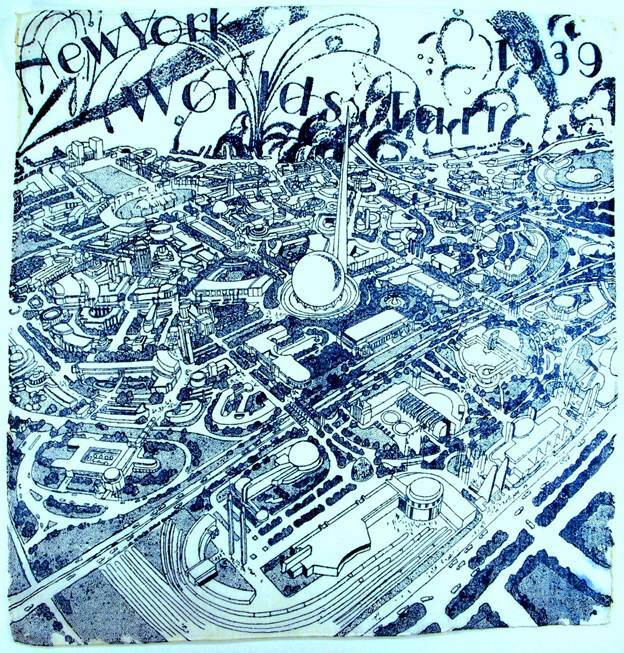 To the Empire State building, the Planetarium, the Aquarium, the Church of St. John the Divine…. 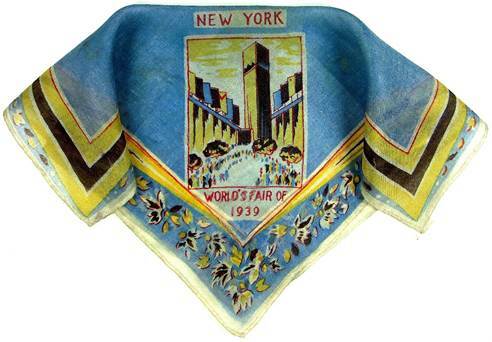 These hankies were reminders, that yes, you’ve visited an amazing Fair, with spectacles from around the world, but look what New York has to offer every day of the week. Breathtaking architecture, dynamic history, and one of a kind experiences, just waiting for you to explore and discover. 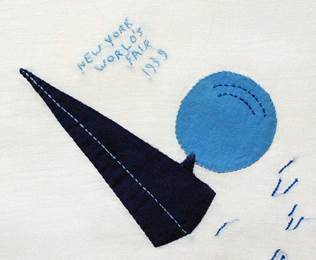 It is impossible to capture the breadth, depth and magic that is New York or one of her Fairs in a blog. This is merely a glimpse into the past, a snapshot of history, and we hope you’ve enjoyed the journey. According to Wikipedia, the time capsule contained writings by Albert Einstein and Thomas Mann, copies of Life Magazine, a Mickey Mouse watch, a Gillette safety razor, a kewpie doll, a dollar in change, a pack of Camel cigarettes, millions of pages of text on microfilm, and more. The capsule also contained seeds of foods in common use at the time: wheat, corn, oats, tobacco, cotton, flax, rice, soy beans, alfalfa, sugar beets, carrots and barley, all sealed in glass tubes. The time capsule is located at40°44′34.089″N 73°50′43.842″W, at a depth of 50 feet (15 m). A small stone plaque marks the position. 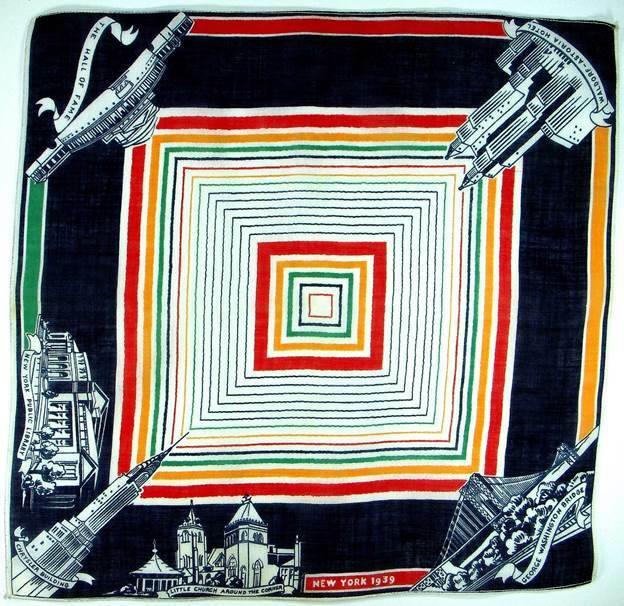 For those who never visited the fair, he’s a personal reminiscence by Janet Lieberman. It’s casual and fun, and you feel as though you’re strolling with her.